Here's to a Happy and Healthy New Year's Eve! It is hard for me to wrap my arms around celebrating New Year's Eve in a healthy way...old habits die hard. So I looked to YouTube for inspiration. I may not have found the total solution but I was amused in the process and thought I would share my amusement with you. The main message I would like to share is that we can change things up, we can make even a New Year's Eve healthier and have fun in the process! Here's to You, to Us and a Happy and Healthier New Year ahead! One of my favorite traditions is ringing in the New Year with a crockpot full of Black-eyed peas (also known as Hoppin' Johns). It is a Southern Tradition. 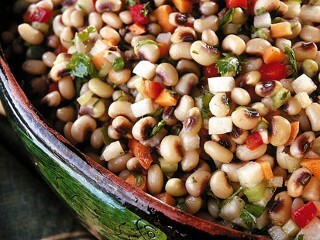 The lore goes that if you start the New Year by eating a bowl of black-eyed peas, it will bring you luck in the year ahead. If you add collard greens with the black-eyed peas you might also get rich. The problem with my tradition is that I learned it the unhealthy way, packed full of grease and fatty ham hocks. Now I am in search of a healthier version that is still flavorful and satisfying of our long standing tradition. I think I have found two great new recipes. One uses bacon for the rich flavor and the other uses pork loin meat in place of the ham hock. They both include greens as part of the recipe so we are covered on the "might get rich" part of the ingredient. Here are links to the two recipes: Black-eyed Peas with Smoked Bacon and Greens from Cooking Light and Black-eyed Peas with Pork and Greens from Eating Well. Let me know which one you tried and whether you liked it or not! We spend New Year's day lounging in our PJs, playing games we got for Christmas or that are our time honored favorites. We usually get out a puzzle to work on too. We have a few friends over to join in the causal fun. And then mid-afternoon we all partake of the Black-eyed Peas and Greens. It is a great way to ring in the New Year. Happy New Year to You! What to do with that holiday cash? I am already thinking about how I want to spend that holiday cash! I want to ring in the New Year focused on a happy and healthy year ahead. Spending a little of my cash on items that will support me in this important endeavor is part of the plot and plan. Since I will be starting my spinning classes in January, I want to complete my gear in anticipation. First, I want to find a reasonably priced pair of cycling shoes. Since I have a big foot, finding this item may be easier said than done. 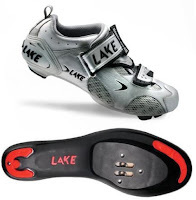 I did find a pair on Amazon for a mere $44- Lake Women's CX211 Cycling Shoe. The other thing I need is a heart monitor. I hate the ones with straps. They have never designed one big enough or comfortable for big chested women. So I am looking for a watch that is simple and wireless. I also don't want to make a very big investment before I see how committed I become to spinning! 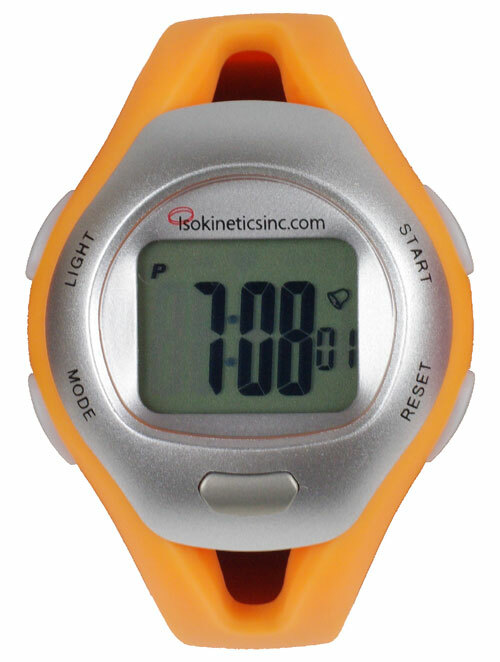 So I found a heart monitor for $29.95- Isokinetics Inc. Strapless Heart Rate Monitor Watch. With a goal to do a 30 mile bike ride this next summer, regardless these will be good tools for me and can be used outside of spinning. My Christmas gifts to me and my health...yes! As the pressure of the holidays increases it seems the pressure to decrease exercise intensifies. I have been thinking how I will continue to move and exercise once we are traveling and in another city for Christmas up to the New Year. 4:00 to 5:00 - Ski hops: Stand with feet together, bend knees and jump a few feet to the right and then left, landing with bent knees. Somehow just seeing this makes me feel like it is possible! I want to believe I can be in control even when I am not at home. I can fit in exercise even when there is no gym nearby. And with the craziness of running from one event to another I can still find 10 minutes, a couple of times a day to burn some calories and feel healthy! In honor of the holiday and our health I wanted to share this Christmas Exercise video with everyone. Hope this brings a smile to your face as it did mine and helps to remind us all to take some time to take care of our selves even in the midst of Christmas. May your day be filled with Peace, Love and Laughter! A mindful quote to help us all be more present when making choices about what we are eating and how much of it we will eat over the next few days! "...America's top killer isn't cancer or heart disease, nor is it smoking or obesity. It's our inability to make smart choices and overcome our own self-destructive behaviors." A couple of years ago I was looking for a way to order wine and have it delivered to a friends house in New York City. 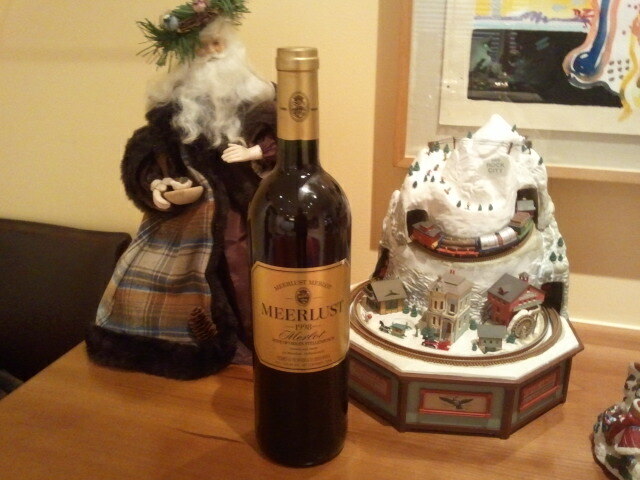 We were giving a dinner party together and I had agreed to provide the wine. When I started looking into wine shops in New York I was shocked at how expensive the wine would be as well as getting it to be delivered. I thought there had to be a better way. I wanted to be able to buy a case of nice wine. As I continued to search on the internet I came across the website Wine.com. For a stewardship fee of just under $50 annually you can have any order, big or small shipped across the United States for free. Just sending one heavy case of wine would cost about half that amount. I thought it was worth trying it out. It worked out well! The wines arrived on time, in good condition and when served they tasted great! They were all delicious wines and well paired with the meal. It was a great find. I now order regularly for my home. I can't beat the convenience of having it delivered right to my home. And I can always find attractive wines at a great price. I also often send just a bottle of nice wine to friends and family in celebration of a birthday or other big event in someone's life. I am able to do this at a price well below any other gift I could send. And it seems it is also really appreciated! A great way to give a healthy gift of wine for yourself or another, wine.com! Ho! Ho! Ho! There are so many types of breads to bake. This time of year we tend to think more about the holiday sweet breads. But when you are ready to come down from that sugar high and bake a hearty, healthy bread there is nothing like a beer bread. Beer breads are an easy way to make a yeast rising bread. The beer serves as the rising agent. They are great to serve with chunky soups and hearty stews. 1. Combine first 7 ingredients; make a well in the center of the mixture. 2. Add beer and egg substitute, stirring until just moist. 3.Spoon batter into regular size loaf pan coated with cooking spray. 4. Bake at 375 degrees for 45-50 minutes or until a wooden pick inserted in the center comes out clean. 5. Let cool completely on wire rack. Yield: 16 servings. Calories per slice: 116. Serve up your bread on right-sized, beautifully designed dishware. Livliga and Kidliga make great holiday gifts! Check out my blog and Facebook for special holiday savings starting November 29th, 2013! 1. Remove the Legs. Slice through the skin between the leg and body using a large carving knife. Pull leg outward with a serving fork and cut through the hip joint, removing the entire leg from the body. 2. Remove the Breast. Slice down one side of the breast bone until your knife meets the base of the turkey. Cut horizontally into the turkey near the base and remove the entire breast. 3. Slice the Breast. Place breast meat on a cutting surface. Hold the meat firmly with the carving fork, then slice thinly across the grain for a tender cut. 4. Separate the Drumstick from the Thigh. Cut through the joint that connects the drumstick and thigh. Thinly slice the thigh meat and remove the meat from the bone, Small drumsticks can be served whole, or to remove meat, hold the drumstick upright by the bone and slice meat off, parallel to the bone. 5. Remove Wings. Cut through the joints connecting the wing bones to the backbone. Serve wings whole. These tips came from the November 2011, Taste of Home magazine. There is also a quick video I found on YouTube that demontrates the process, making it even easier to understand how to carve the turkey. Now for the hands on practice at Christmas! Good luck! Dear friends of mine, who have been well aware of the healthy lifestyle journey I am on, gave me a great gift recently. They gave me a Tabletop Mister by Prepara. I have tried a number of misters over the years but all of them failed shortly after their first use. They would always get clogged or break. Now the science has finally come into its own. The Prepara Tabletop Mister is simply designed and uses pump action to create the pressure for misting. You can pick what variety of oil you want to use, I chose olive oil. You can even add your own flavoring from fresh garlic to your own herbs, like rosemary, from your garden or local grocery store. And it comes in different colors so you can match it to your kitchen. I am inclined to get more than one, all in differnt colors, so I can have differently flavored oils at the ready for all the variety of cooking I do. Ultimately this is a very healthy way to cook with oil. It is also way more environmentally friendly since you don't have to throw away all those empty canisters of cooking spray. And it is infinitely able to be personalized. If you go online you can find ones available for only $16 so it is also very affordable. A great gift for a friend...and you! I was roaming around the internet looking for some stress relieving amusements when I found this "stress test". It just takes a few minutes. It is a nice brain reliever during that time...no need to think about anything else you are supposed to be doing, which already makes it helpful. Take it and see how you score! I basically wanted to find out about all possible stress relievers. The test basically leads you to simple steps you can take to relieve the various stresses in your life. No magic pill just good quick tips and reminders of helpful tactics. I always need reminders so I found this helpful. Hope you do too! My sons gave me a great gift I think would make a great holiday gift for others. It is a Fitbit. 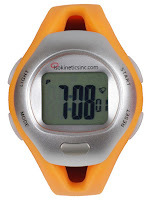 It is fundamentally an elegantly designed pedometer. However, through its online component, you can track many more things that are important for living and maintaining a healthy lifestyle. You can track your overall exercise, the amount of calories you consume per day, your weight, how much you sleep and also in put your blood pressure, glucose and heart rate. It is so convenient and eye-opening to track all these aspects of your health in one place. 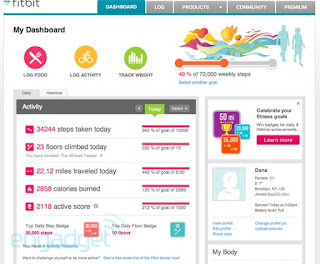 You can even make your information public to the Fitbit community if that is a motivator for you. There are great historical graphs so you can see how you are doing over time in managing your health and achieving your goals. You can compare yourself to others online with the Fitbit which can help you gain a perspective on where you are and where you want to be with your activities and health. It is actually an online community so you can tap into groups and participate in conversations, train for events with others, get your own questions answered or just follow what others are up to. As a personal way to keep track of your thoughts, there is also a journal component of the Fitbit which allows you to make daily entries about your thoughts, goals and feelings about your health, activities, eating habits....you name it, your choice! 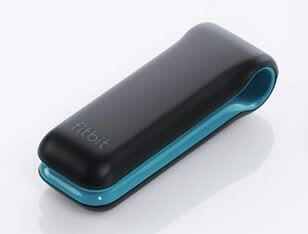 It has a wireless tracker so there is no need to upload your information from the Fitbit you wear. It will automatically upload to your computer. For $99.95 you get the tracker and access to the online software. 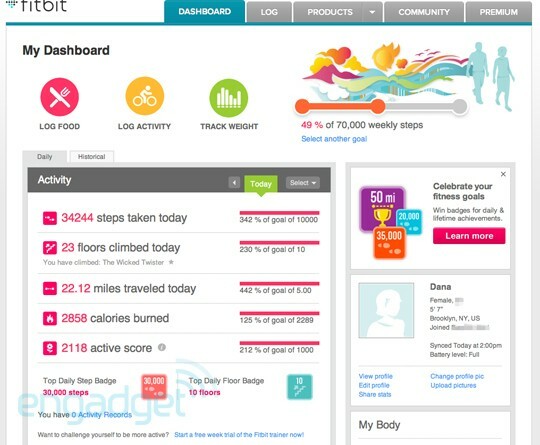 There is also a premium package that provides even more information if you really get into the program and want more from the Fitbit. I stuck with the basic package and have found I have more than enough information and access to keep me engaged and informed about my health. The only caveat I have about the product is that it is small and can be easily lost. I have forgotten to remove it from a piece of clothing I had it clipped to more than once. It is black which makes it subtle on your clothing but therefore also easy to over look. I hope they come out with some "hot" colors so they are more personalized and easier to see. 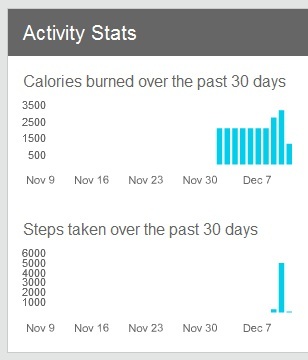 It is amazing to me how many people have the tracker. Once you are a member of the community you become aware of others who are part of it too. That makes it a lot of fun to discover who is out there you know. This is definitely a useful product and one you can enjoy over time with just an initial investment. I recommend it! I came across an interesting article that talks about the health benefits of living at a higher altitude. I always thought a higher altitude was harder on your health. People get dehydrated more quickly, breathing can be more difficult and you get sun-burned more easily. It may be for just these reasons, and more, that our bodies become healthier...they have to work a little harder. The Altitude Research Center in Aurora, Colorado has done studies to show that any place with mountains has definite health benefits. For one, at really high altitudes you will lose weight due to hypoxia or lack of oxygen. Without as much oxygen not as much gets absorbed. This is great for decreasing obesity. And becasue obesity directly influences diabetes, lung issues and heart diseases, high altitude can also improve your overall health. The Robert Woods Johnson Foundation came out with a study this past summer which sited Colorado as having the lowest obesity rate as well as lower heart diseases, diabetes and some cancers in the United States. What is it about Colorado that the other active lifestyle states don't have? Altitude. With an average altitude of 6,800 feet above sea level, Colorado is the highest state in the U.S.A. Who knew? 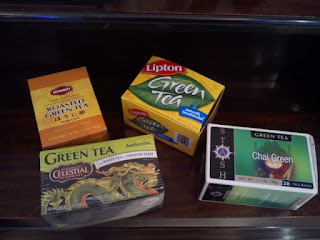 Green Tea or How to keep Healthy Over the Holidays...and Beyond! Although tea drinking has been associated with health benefits for centuries, only in recent years have its medicinal properties been investigated scientifically. The October issue of Harvard Women's Health Watch recognizes the healthy power of tea while helping readers get the most out of their cups. Tea's health benefits are largely due to its high content of flavonoids — plant-derived compounds that are antioxidants. Green tea is the best food source of a group called catechins. In test tubes, catechins are more powerful than vitamins C and E in halting oxidative damage to cells and appear to have other disease-fighting properties. Studies have found an association between consuming green tea and a reduced risk for several cancers, including, skin, breast, lung, colon, esophageal, and bladder. Additional benefits for regular consumers of green and black teas include a reduced risk for heart disease. The antioxidants in green, black, and oolong teas can help block the oxidation of LDL (bad) cholesterol, increase HDL (good) cholesterol and improve artery function. A Chinese study published recently in the Archives of Internal Medicine showed a 46%-65% reduction in hypertension risk in regular consumers of oolong or green tea, compared to non-consumers of tea. Drinking a cup of tea a few times a day to absorb antioxidants and other healthful plant compounds. In green-tea drinking cultures, the usual amount is three cups per day. Allow tea to steep for three to five minutes to bring out its catechins. The best way to get the catechins and other flavonoids in tea is to drink it freshly brewed. Decaffeinated, bottled ready-to-drink tea preparations, and instant teas have less of these compounds. Tea can impede the absorption of iron from fruits and vegetables. Adding lemon or milk or drinking tea between meals will counteract this problem. A simple gift we can give to ourselves now and in the New Year. Better yet, give the gift of health by taking the time to share in a cup of tea with a friend over the holidays! This time of year, when we are out and about at holiday parties and having the tendency to over indulge, it is nice to know that some of what we eat and drink is actually good for us! The challenge is to enjoy but not over indulge to the point of miser, gaining excessive amounts of weight or harming rather than helping our bodies. More and more research is validating the benefits of drinking some alcohol each day. One or two glasses of wine a day (5 oz each), for instance, can decrease the average person's risk of dying during any given year by as much as 25 percent. It has been determined that people who drink one or two drinks daily have a 25 to 50 percent lower risk of heart attack, a 40 percent lower risk of stroke, and about a 33 percent reduction in the risk of developing diabetes. Red wine, and now dark beer, appear to have the most benefits. Not only do they contain elements which reduce inflammation that helps with heart disease but they also contain anti-aging ingredients. Additionally, the alcohol helps with stress relief and has anti-anxiety benefits. As The O'Keefes explain in their book- The Forever Young Diet & Lifestyle - "Happy and healthy usually go hand in hand. Sitting down at happy hour to unwind and emotionally connect with important people in your life can help to make you more relaxed and improve your overall health." During the holidays, connecting with friends and family in a positive way, without getting caught up in the frenzy of the season, is one of the challenges we face. It sure sounds appealing however! Finally, a tip I have read in numerous places to help us pace our alcoholic consumptions is to drink a glass of water prior to sipping your alcoholic beverage. Another trick is to take alternating sips of water and alcohol. It will slow your pace of consumption and allow it to last longer, keeping you in control and less likely to drink more than the prescribed 2 glasses of wine or 1 dark beer. I am a baker. I love the smell of bread baking in the oven. I love sharing what I have baked with others. At Christmas time I have the tradition of making Poppy Seed bread and giving it to friends, family and neighbors as a gift. When the kids were little the list of people for whom we made bread was long since it included teachers, coaches and those who shared in our active children's lives. I secretly delighted in baking all that bread and in providing the loaves for my kid's list. They loved giving it to others. It made my heart glad. It is that time of year again! This year, though, I am looking for a healthier bread. Never fear, I will still make my Poppy Seed bread but I also want to add a healthier bread to my stable. I am even planning on sending these breads to friends and family by mail. This will also be a new adventure. So I have been looking for a healthier bread that I think will mail well. 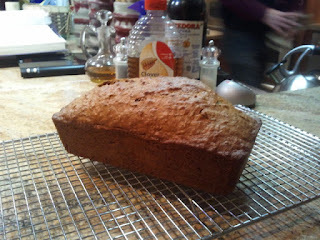 I think I have found it- Banana-Date Flaxseed Bread. I baked a test loaf this past weekend to try it out. It looked great coming out of the oven; it makes an attractive loaf. It smells heavenly and is packed full of healthy ingredients. It has both flaxseed meal and flaxseeds in it along with banana and dates. My husband, my daughter and I tried it out. It was tasty and had a nice "nutty" flavor to it. Not only will this be good with butter, but I can also see making cream cheese sandwiches with it. 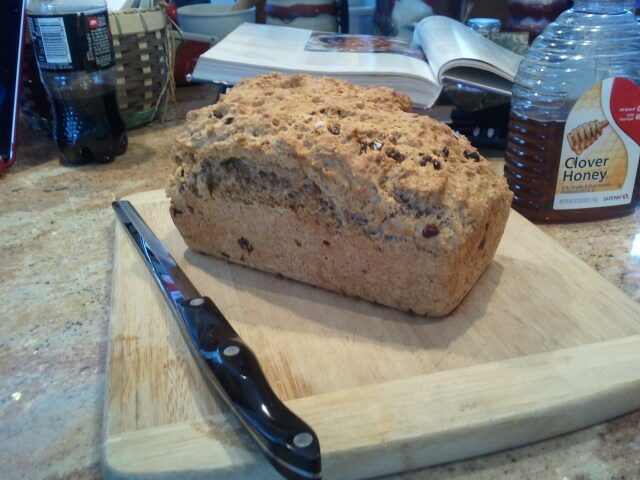 The best is that it is a dense bread so I think it will travel well. It will also be a nice complement to the Poppy Seed bread. Combine this bread with a green tea and it is guaranteed we will stay healthy through the holidays! We had so much fun last night. We went to the annual holiday concert at our local university. We got hooked when we first moved here and a friend introduced us to this special occasion. The best is that the audience gets to sing! All the favorites are sung as a montage and then at the end, for the hearty, there is the Hallelujah Chorus. Heavenly. It always gets us in the spirit of the Season. The challenge with concerts, though, is that you have to get there early and by the time you get out, it is on the late side for dinner. I have found with a little planning, and a crockpot, you can have a delicious meal ready on time, enjoyed, and still have time to get to the concert. This time of year stews, soups and ragouts are hearty, cozy meals for a cold night. Last night I tried out a spicy (yet not too spicy) curry. It had the added benefit of being vegetarian. To find yummy, filling and easy vegetarian I have found to be a bit of a challenge for this dedicated omnivore. I hit a home run last night! 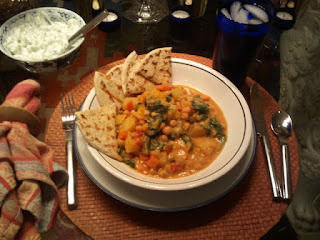 I found the recipe on line- Vegetable & Chickpea Curry - so you can try it out if you so desire. I truly thought this was a wonderful recipe. As you will see with the recipe, it has an array of delectable ingredients from fresh ginger, Serrano pepper and chickpeas to light coconut milk and spinach. I served it with grilled flatbread and a cucumber-yogurt sauce to mellow the heat in the curry. Add a light beer and it amounts to a memorable meal. My new favorite. A delicious meal, easy to make, delicious to eat and a holiday sing-a-long...what more could a person want?!? Indeed, I am now "in the spirit" of goodwill and goodmeals. Happy Beginning of December! As I have mentioned in previous blogs, I have made it a goal to work out when I travel. This Thanksgiving we all had the opportunity to go to a dude ranch thanks to my generous parents. Once there we were able to gather with 25 of our family. It was a great time to take advantage of the activities at the ranch. My daughter lives to ride. She has been riding in a therapeutic riding program since before she was two. The difference between riding in a program and riding at a dude ranch is that she gets to be off lead. This is HUGE. So, thanks to the understanding and support of the ranch, she got to go on two "walking" trail rides, each about two hours long. I rode behind her on both rides. My husband and two sons also rode at various times. I grew up riding thanks to my dad who had/has a passion for horses. It was great fun getting back on a horse. I got to ride three times-- two times with my daughter and the third on a "loping" ride with my husband, and others. Each time I rode I got on the back of a different horse. It was a great work out for various muscles I don't often use. The knees also felt the ride! In addition to riding, I used the work out facilities a couple of times and also played tennis with my daughter. It made for a fun holiday, spending active time with my family. Who says you need to be comatose on a couch in order to enjoy Thanksgiving? I still ate too much, but at least I balanced it with some exercise, shared with family. I am beginning to really see it is possible to be active wherever I go and with others around me. And perhaps most important of all, it is fun!